This is FEMA. 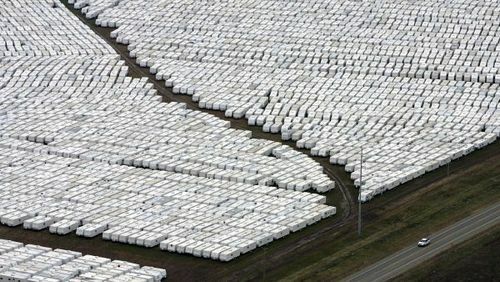 The famous toxic trailers of Katrina. This is the federal government when it puts its heart and wherewithal into a project. So, why’s Ron Paul crazy for suggesting that we don’t need FEMA? As you can tell, he’s not in the least. They’re just running scared. Next, Chaz Bono is, bless his heart, getting on my nerves. I got it. You’re transgendered. Solid. Now, let’s move on. Next, our national religion of 9/11 is coming up on its first decennial and, as you can imagine, no one wants to ask any questions. So what else is new? Listen. Critically think. ← LIONEL PODCAST: I’m Back. Post-Irene Musings, Climate Fraud, Loving Cheney And When the Sh*t Hits The Reporter.